Do you remember the days of teaching when we strived to teach everything in such a way that our students will run home and tell their parents about it, because they were so excited? When learning was meaningful and not structured around facts? Well, readers of this blog may, but according to a recent post by David Warlick, half of all U.S. teachers have never worked in an education system where high-stakes testing didn't drive the bus. You should read the entire post but here is the piece that really resonated with me. "For me, it was a full 25 years before No Child Left Behind standards-based teaching and punitive high-stakes tests stained the “art of teaching.” Things were quite different in terms of the autonomy that teachers exercised in determining what and how their children learned – and some mediocre teachers, admittedly, took advantage of the freedom. However, most, whom I came in contact with, used their academic freedom as a seedbed to create dynamic and effective learning experiences for their students. For years I have felt that this-too-will-pass, that the arrogant belief that we can know and teach everything our children will need to know to be prepared for their future simply makes no sense, and that we would come to our senses." I have also said "this too shall pass." Well, "this too" is showing no signs of passing. Next year marks my 30th year in education. For most of my career, we had what is now a luxury to take what students should know and use what tools we were given, and build lessons that were long-term, engaging, and multi-dimensional. 30 years? Yeah, I'm old. Old enough to clearly remember many things that today's teachers will never know. 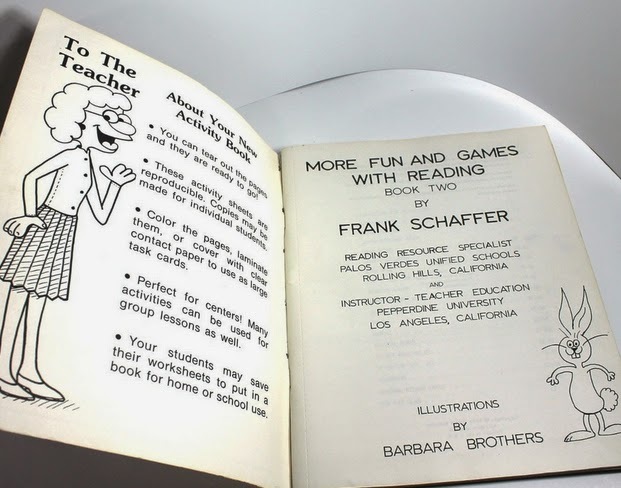 I mean, who remembers Frank Schaffer ditto books? And using papier-mâché with your students to build solar systems. (In class - not to send home for homework. Same with science fair projects: in class - not homework.) I even created an entire unit around the 1998 Olympics in Nagano. The unit included every area of the curriculum, and lasted as long as the Olympics. It even included correspondences with the Olympic athletes via email (we had one dialup connection in the library and I used my AOL account with my students). It makes me sad to think about how students are learning today. They are missing out on the joy of learning. They are being forced to watch for the end goal, rather than enjoying and making the best of the journey. There are certainly examples of outstanding teachers who are able to fight their way through the muck to create innovative learning environments. But they are few and far between, and it is shameful that testing requirements, and the rapacious micro-oversight, forces them to expend every bit of energy just to do what we they know is right for students. Will this too pass? I doubt it. And if it does, I fear what damage will have been done and can't imagine the magnanimous and colossal efforts that will be required to put the pieces back together. This video makes an excellent point with an analogy between life and music.